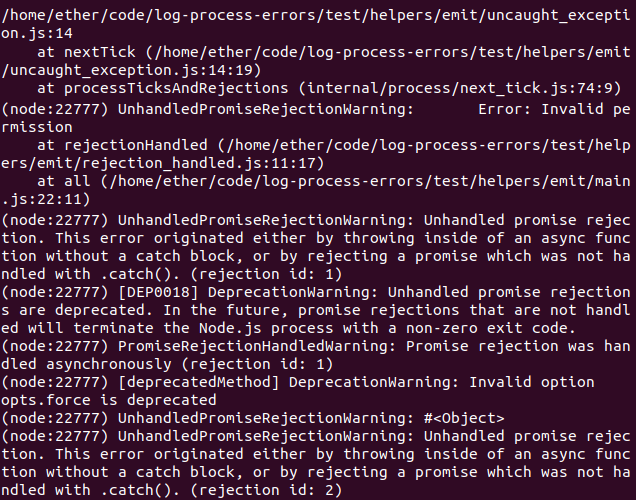 Show some ❤️ to Node.js process errors. do not show stack traces for warning and rejectionHandled making them hard to debug. 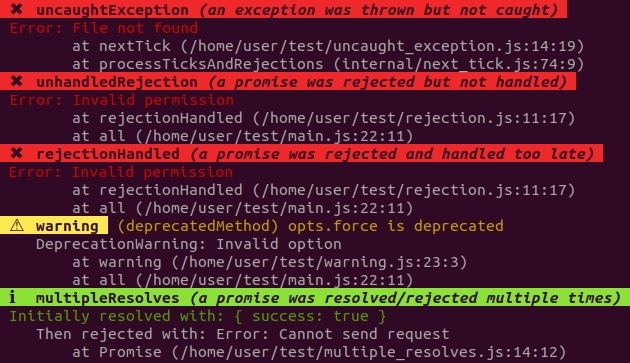 do not include multipleResolves errors (when a promise is resolved/rejected twice). are inconvenient to log to an external service. are printed each time an error is repeated (except for warning). log-process-errors fixes all those issues. Proper logging of process errors in production. Debugging of process errors in development. Automated testing of process errors. either directly in your browser. or by executing the examples files in a terminal. This is because logging is modified globally and libraries users might not expect this side-effect. Also this might lead to conflicts between libraries. logProcessErrors() should be called as early as possible in the code. options is an optional object with the following properties. Customizes how process errors are logged. Which log level to use. Which process errors should trigger process.exit(1). Value: "ava", "mocha", "jasmine", "tape" or "node-tap"
When running tests, makes them fail if there are any process errors. Default: true if the output is a terminal. If you found a bug or would like a new feature, don't hesitate to submit an issue on GitHub. If you would like to help us fix a bug or add a new feature, please check our guidelines. Pull requests are welcome!